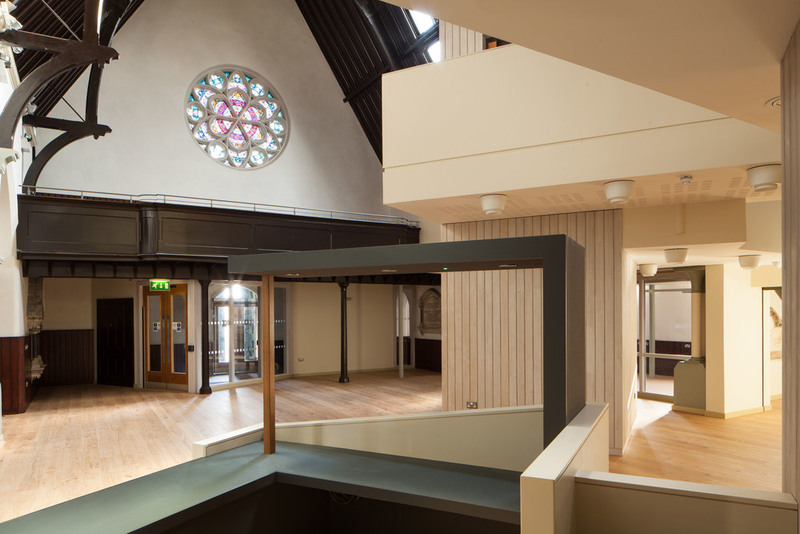 Doherty Architects were commissioned to design the conversion of the former Duncairn Church to a Centre for Arts and Culture. The building is listed Grade B+ by the NIEA due to its historic value as part of a unique complex owned by the Presbyterian Church and also due to its architectural merit as a fine example of decorated Gothic style. The original church and manse, built in 1862, was designed by W J Barre. Subsequent additions, including the side aisles and the organ recess, were designed by Young & McKensie. The Halls were added in 1915. 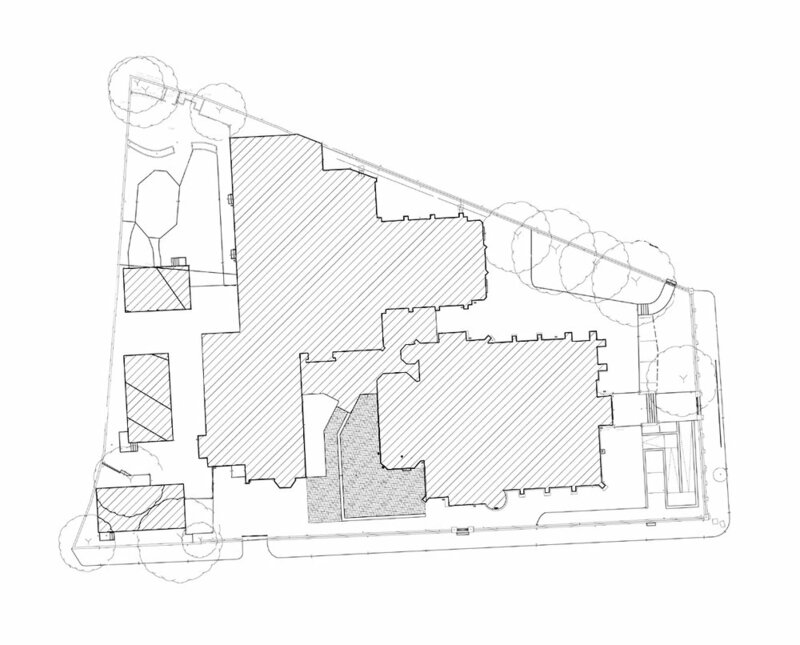 The overarching design challenge was to insert new enclosed functions within the main church space whilst retaining the spatial primacy and character of the original structure. We identified the maintenance of the axial view from the main entrance to the rear gothic window as critical in this respect. Our strategy was that simple modern and visually lightweight interventions would complement the heavy original construction. Our main insertion serves as a platform for the Performance Space at first floor level which runs across the central nave and joins the north and south transepts. Below this is tucked the café enclosed by a series of light-weight pods, skewed at an angle to deviate from the formal geometry of the original space, and split apart to allow glimpses through. A new lift connects the ground and first floor within the open void at the Exhibition Space and its shaft is treated in the same simple sculptural geometry as these new pods. They are all clad in translucent white vertical boarding in keeping with a simple, modest, Presbyterian aesthetic. 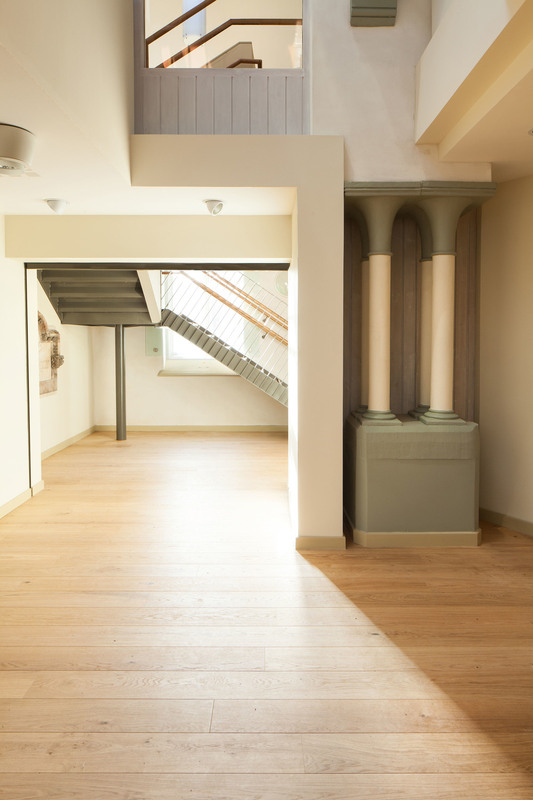 This light cladding contrasts with the dark wood of the restored hammer beam roof making the interventions and the original works readily distinguishable. The new connecting building is deliberately understated in scale to defer attention to the listed complex of buildings it connects. Like the new insertions in the church, the link is modern in form and detailing so that newly built elements are easily legible against the old. Insertions are set back from the existing structure in order to allow full reversibility; they are intended at all times to be servitude and to accentuate the historic features. 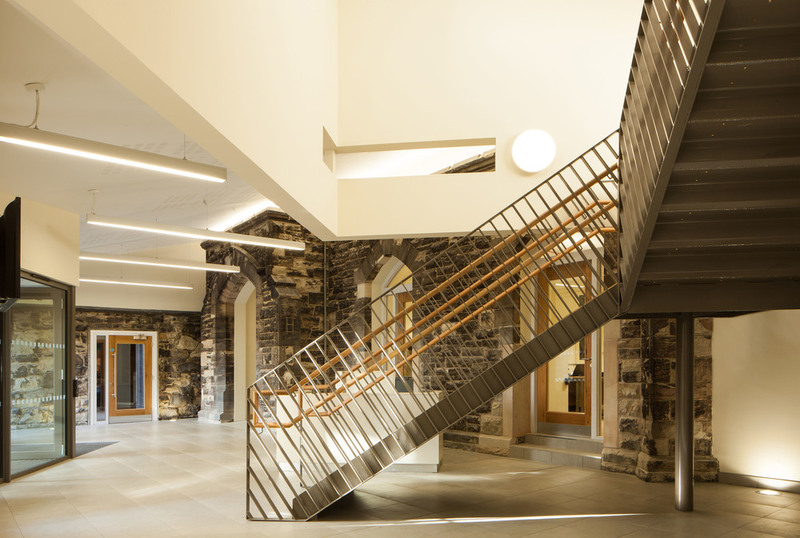 The main entrance to the Cultural Centre on the Antrim Road makes a statement of access, renewal and vitality and returns the building to its place as focal point for public and commercial activity. 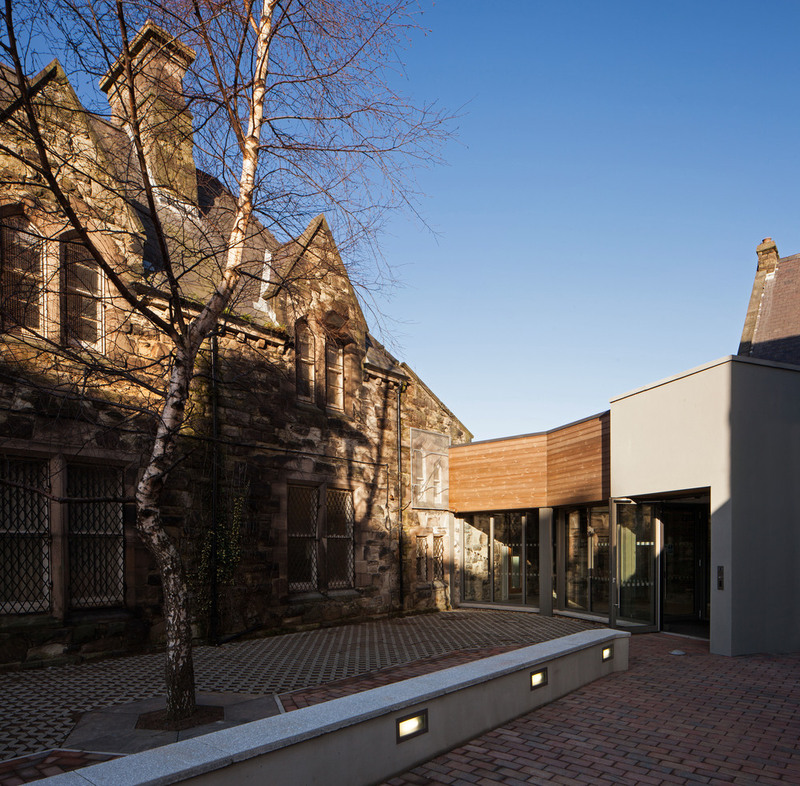 Royal Society of Ulster Architects Bi Annual Awards 2014. Conservation Commendation. Royal Institute of Chartered Surveyors NI Annual Awards 2015. Conservation Winner. Royal Institute of Chartered Surveyors NI Annual Awards 2015. Community Benefit, Shortlisted. Royal Institute of Chartered Surveyors NI Annual Awards 2015. Regeneration, Shortlisted.